A rather unusual hand made paper doll. The 3" paper doll is a cutout from a magazine and depicts a rear profile of an older woman. McLoughlin Bros. 1875. This doll is the same doll later used in the Dolly Varden Series for Betsey Brunette and Bertha Blonde. McLoughlin Bros. 1875. This doll is the same doll later used in the Dolly Varden Series for Betsey Brunette and Bertha Blonde. A 13 1/4" embossed die-cut Victorian scrap depicting a young boy in sailor suit and red cap with fishing net. 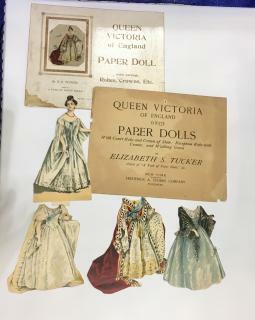 This set may be more familiar in the die-cut boxed verse, but was among a series of paper dolls made by Tuck as a way allowing people of various income levels to afford this popular paper doll. 7” paper doll with 11 of 12 costumes from a Year of Paper Dolls, by E.S. Tucker.1895. Frederick A. Stokes Co. NY. A two-sided 11” Baby Blue paper doll with three (3) two-sided costumes by McLoughlin Bros. c1876. It is from the Dolly Varden Dolls series, which introduced a dramatic change in the style of previous dolls. A 13 1/2” x 16 1/2” uncut sheet on thin stock. Printed and hand colored in vibrant shades. Each consists of 7 pieces and when cut and constructed would measure 16” high. They are a stereotypical Chinese and Turkish man.. Marked Druck u. Verlag v. C Burchardt s Nachf Weissenburg (Els)..
Nine (9) gouache paper soldiers Believe to be French Infantry Soldiers. c1870s. Most like printed by F. Wenzel Five (5) different 6 1/2" x 3 1/4" embossed die-cut Victorian scraps of snow angels. c1900. Includes two approximately 5" mirror image cutwork (folded in half and cut so left and right sides are identical), a free hand horse with vertical slices in the tail to give the appearance of hair and a folded paper cart constructed of a base, harness and wheels all held in place with straw. Naive pencil decoration on the two woman. A set of Victorian Scrap or Relief alphabet or ABC occupational die-cut figures circa 1880.
http://www.eclectibles.com/Paper_Doll_Indentification_Guide_p/2.htm This rather large late Victorian family includes a mother and father and 11 girls and 6 boys. Note that each of the boys is wearing a hat of some form. The older girls are also wearing hat and the younger boys are in short pants.. The dolls range in size from 5 3/4” high to 1 1/2” high. The dolls have simple yet expressive faces. Various emotions portrayed -- just like a real family A charming group of folk art paper dolls. Few small imperfections with minimal detraction. 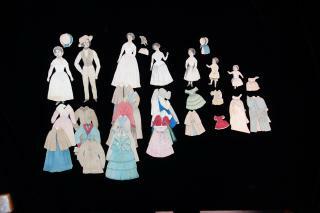 A single paper doll set with the same character and costumes as included in "Famous Queens and Martha Washington" a larger boxed set. Illustrated by Elizabeth S. Tucker. It includes Queen Victoria and three period costumes. The doll is wearing a white petticoat covered with a white peignoir tied with a blue bow. the costumes include a walking gown, court robe, and reception robe. Additionally the set includes a booklet with a brief introduction to the doll and instructions on use and play. and the original box top with an applied litho of the queen. Doll 7" tall and booklet and box lid approx. 10" x 8”.
. The family is all together with the seven members: Father, Mother, Miss Adelaide, Clara, George, Baby, and Bridget the Nurse. Each doll has multiple hand- colored costumes that match with their age and character. Most with three costumes, two with two costumes, Miss Adelaide has two extra hand made dresses. Few hats. Sizes of the doll vary, the father is largest at 6 1/2". .
A truly fanciful fellow with a printed face,and card stock body parts that have been decorated with applied and layered polished and foiled papers. His exaggerated hat has a large applied flower. His bodice begins with pleated paper dickey and velvet bow tie; a crest is applied beneath the dickey. His waistcoat is constructed of various foiled papers with red embellishment and embossing. His topcoat is velvet with studded border trim topped with a large red silk bow. The arms and legs are jointed at the shoulders, elbows, hips and knees.. A 12" Scotsman dressed in a traditional kilt with with shoulder sash and belt. Embellished with feathers on his hat and belt. Finely detailed facial and hand features. Not the detail on his stockings. A simple string mechanism allows him to dance..